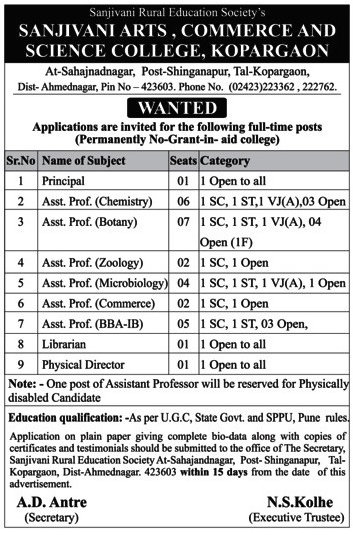 Sanjivani Arts Commerce and Science College, Ahmednagar has advertised for the recruitment of Teaching Faculty- Assistant Professor Plus Non-Faculty jobs vacancies. Interested and eligible job aspirants are requested to apply within 15 days from 24th November 2018. Check out further more details below. About College: Sanjivani takes its names and inspiration from the famous Epic of Ramayana where ‘Sanjivani buty’ was brought for revival of life. Sanjivani Rural Education Society (SRES), was established by Honorable Shri. Shankarrao Genuji Kolhe in the year 1983, at rural place Kopargaon, which is in Ahmednagar district of Maharashtra state, India. Initially they started engineering and polytechnic college at Kopargaon with basic branches of mechanical, civil and electronics. Since establishment the institute has attracted the students from all over India. With an excellent academic quality, the institute established good brand image in the minds of students and parents. As the market changed, SRES understood the need and added more number of courses under the umbrella of Sanjivani. How to Apply: Interested and eligible candidates are requested to send their application on plain paper giving complete bio-data along with copies of certificates / mark sheets, copy of Aadhaar card, copy of PAN card and recent PP size photos to the following postal address.